Xenon lights help lead space shuttle Endeavour home to NASA's Kennedy Space Center in Florida. When NASA's shuttle Endeavour landed in Florida Wednesday (June 1) to end its last-ever trip into space, the orbiter also apparently doubled as a crime-fighting machine. As Endeavour re-entered Earth's atmosphere and glided toward the runway at Kennedy Space Center at a blistering pace, the orbiter heralded its arrival with two sonic booms — a trademark of all shuttle landings. The shuttle's sonorous notes woke up a Florida woman who then witnessed two men inside her car in her driveway and called the police, according to the Osceola County Sheriff's Office. Officers from the Osceola County Sheriff's Office responded to a call on Amanda Kay Way in Kissimmee, Fla., at 2:31 a.m. EDT (0631 GMT). 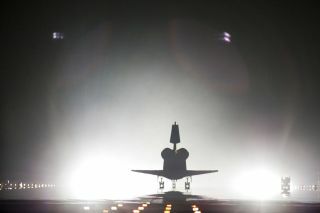 Endeavour touched down at NASA's Shuttle Landing Facility at the Kennedy Space Center at 2:34 a.m. EDT (0634 GMT). As a space shuttle approaches its landing site, two sonic booms less than a second apart can be heard overhead as the orbiter slices through the atmosphere and races Earthward faster than the speed of sound. The thunderous noises are created by air pressure and shock waves that form at the vehicle's nose and tail. The victim told sheriff's deputies that the sonic booms from Endeavour's landing woke her up, and when she looked out the window, saw two males inside her vehicle, which was parked in her driveway at the time, officials with the Sheriff's Office said. She said she then saw them run through her yard and get into another vehicle. Deputies searched the area and tracked down the two suspects a short distance away. Melvin Andrew Manning, Jr., and Justin Dinzey, both 18, were brought in for questioning and charged with burglary. The suspects also provided information about four more car burglaries and another residential burglary in the nearby city of Remington. Investigations for the string of burglaries is ongoing and additional charges are pending, according to the Sheriff's Office. Endeavour touched down at Kennedy Space Center after its final 16-day mission to the International Space Station. NASA is retiring its space shuttle program but has one final mission planned for early July – the final flight of the shuttle Atlantis. After each shuttle completes its final mission, they will begin the months-long process of being decommissioned and prepared for their public display at museums around the country. Endeavour has been promised to the California Science Center in Los Angeles; Discovery will find a home at the Smithsonian Air and Space Museum in Washington, D.C.; Atlantis will be displayed at the visitor center at Kennedy Space Center; and the test vehicle Enterprise will be moved to the Intrepid Air & Space Museum in New York City.